I tend to go on a little creative kick meaning when I like a background or technique I tend to create a whole bunch of something at one time. This worked out well as I had many galaxy backgrounds all ready to go in my stash. I created the background using canson watercolor paper, my Kuretake Gansai Tambi water colors, Fintech water -color paints and Copic opauqe white ink. Creating these backgrounds are so easy and really relaxing, its jsut about adding the colour to paper and seeing what you get. 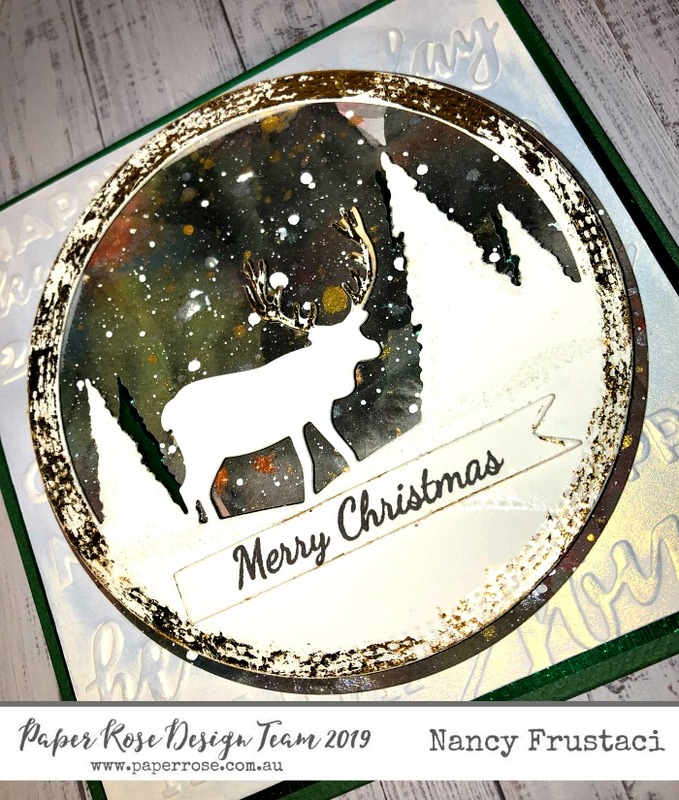 I created a 5 ¼ x 5 ¼ card as I wanted to make the focal point of the card, the wondeful Deer Scene die. I ran the white panel through my big shot using a festive embossing folder. (I believe is retired- linked to something simalar below). I decided I wanted to add some shimmer to the embossing panel so I pulled out my Comic shimmer gilding polish and went all over the embossed panel. I love how it caught the letters and really made it pop. 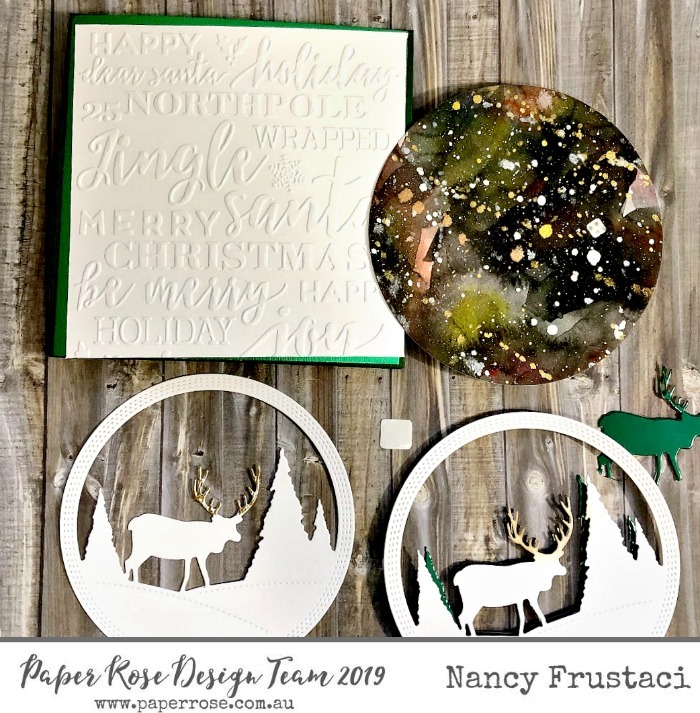 I set that aside and went back to my die cutting machine where I die cut out the galaxy panel along with four or five layers of the deer scene with differnet types of card stocks, from Neehna 110lb white to metalic green and brown. I decided to fussy cut out the deer form the green die cut layer and adhered it behind one of the white layers using foam tape and slightly off setting it so you could see the green peeking through. I repeated the the process with a slight change, I cut away the trees instead of the deer and again layered it underneath the one of the white die cut scene again using a bit of foam tape for diemension. I really wanted to give this image depth and I think I managed to do that. I had another white die cut scene that I wanted to finish off with some gold foil before layering with the previouly worked on layers. 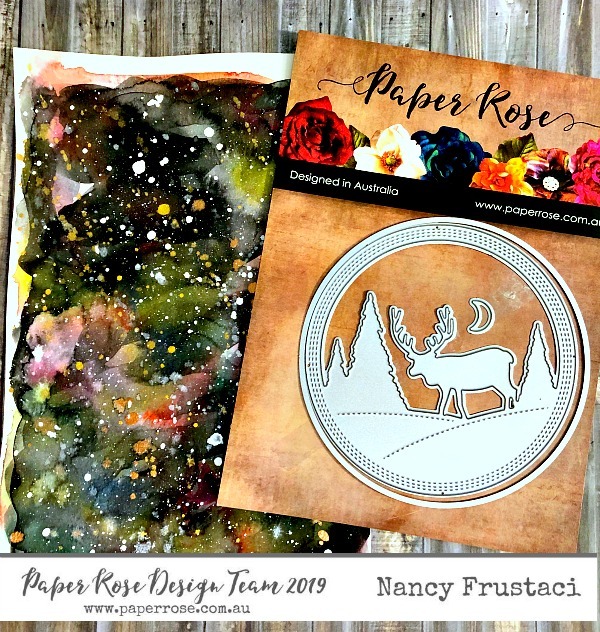 I took my zig glue pen and went around the cirle form and the deers antlers, let the glue turn from blue to clear and then added the gold foil on top of it. I also decided to add foil around the sentiment strip – which I die cut using the Paper Roses Stars and banners die. Finally, once all the layers were completed and put together it was time to add everything to the actual card base. 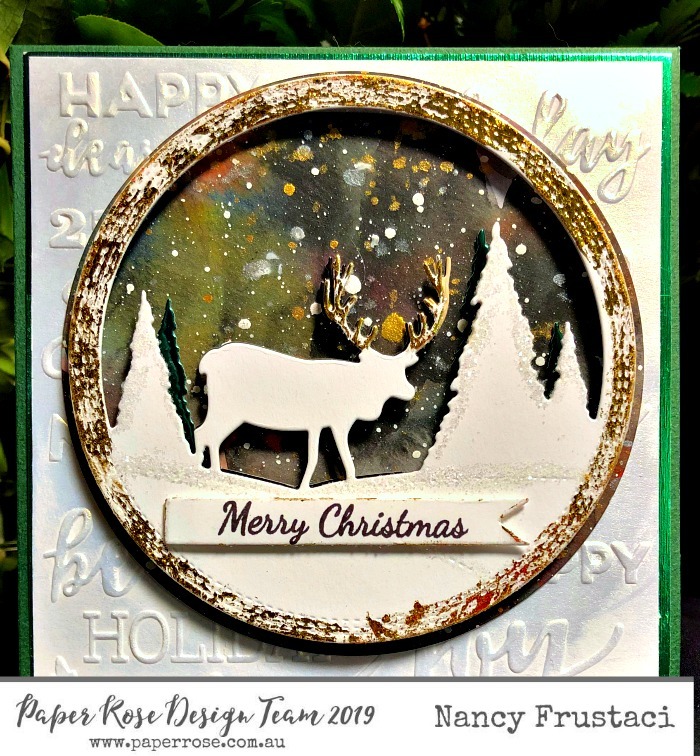 Everything was put on to the base flat with strong adhesive as there was enough dimension with the actual focal point of the card which was the deer scene. I hope you enjoyed the card and were able to get some inspiration from it. I encourage you to share a comment.